Workplace needs are changing from conferencing access for only a few employees to multipurpose spaces for many. From the Pacific Northwest down to Texas and up the Northeast corridor, forecasts about the 2012 AV integration recovery outlook are as varied as recipes for mom’s apple pie. Unlike politics, there is no bellwether for predicting this year’s AV growth index. So we went around the country to uncover insights and spending trends for distinct regions. Verrex sees traditional workplace needs changing from silo offices and conferencing access for only a few employees to multipurpose spaces, desktop conferencing, and mobile conferencing for many. “Significant technology and IT infrastructure investments are being made to accommodate this push toward broader collaboration and mobility,” he said. While government work, local, regional, and national, has helped keep the integration business afloat, he sees this area of opportunity waning as stimulus monies and allied projects run their course in conjunction with continued public sector funding problems. Data Projections offers the Polycom OTX, a high-end telepresence system presents margin opportunities for the larger Fortune 500 companies. 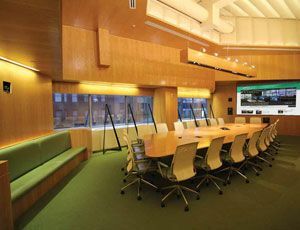 Dimensional noted pent up demand in IT -based corporate telecommunications upgrades including business, telephone, and videoconferencing systems, as well as associated AV systems for conference rooms and meeting spaces. Cloud environments also provide technology potential, he said. “Breaking down barriers between devices, storage, and access has always beat building up silos and fences; this is a key tenant driving converged systems along with greater bandwidths. This means integrators need to understand mobility devices and connectivity in how people want to use their systems and manage content. Leadership through the fog of convergence is still a great asset for integrators, as are deep IT chops. The same can be said for most emerging network-centric technologies such as AVB, wireless data, RF over UT P, HDBaseT, and the ubiquitous IP ecosystem including SI P transport.